BANFF NATIONAL PARK – This year, 16 black bears, a wolverine, several wolves, and countless elk and deer have been killed on the highways and railways in Banff, Yoho and Kootenay national parks. No grizzly bears have been killed, so far. Photo credit: Parks Canada/HighwayWilding.org , Calgary Herald. A grizzly bear crosses an overpass in Banff National Park. It was captured by a remote camera. But the human-caused animal death toll keeps rising — due, experts say, to a late spring and hot summer that has kept bears in the valley bottoms, and also to increased traffic speeding through the park. “It’s only a matter of time before they end up getting hit,” says Steve Michel, a human-wildlife conflict specialist with Parks Canada. Of the 16 black bears killed so far this year, 12 have been struck by motorists and four have been hit by trains. Another 10 black bears have been struck, but it’s unknown how many of those animals died. Either way, it’s already twice the annual average of 7.8 black bears killed in the three parks — and the season is far from over. The spike in mortality has led to a renewed discussion among parks officials about finding ways to prevent bears from being killed on transportation corridors, ranging from electric fencing and electro-mats, to additional parks staff and more wildlife crossings. Environmentalists say those are all good measures, but suggest everyone has a part to play in animal mortality in the parks. “The reality is that Parks Canada just received one of its biggest budget cutbacks,” says Sarah Elmeligi, senior conservation planner with the Canadian Parks and Wilderness Association. “In this particular situation, the responsibility to prevent that mortality falls on every single person who travels in the park. “It’s preventable if people just slow down,” she suggests. Jeff Gailus, a conservationist and author of The Grizzly Manifesto, says a crackdown on speeding is the best way to deal with the issue. “It’s a race track,” he says, noting animals can always find a way to get over or around the fencing. Still, Gailus says it would be a lot worse if it weren’t for the wildlife crossings already in the parks. Banff has become known worldwide for reducing human-wildlife conflict, a reputation that stems from an often controversial strategy that has cost hundreds of millions of dollars in highway upgrades, wildlife crossings and fencing. Earlier this week, Michel took the Herald on a tour behind the fencing to the Wolverine overpass, named because it’s located near Wolverine Creek. Once there, it’s instantly quieter as you drop down into the middle of the overpass. The bevelled edges and natural foliage shield the animals from the noise of the day-to-day traffic as well as any glare from the bright headlights at night. “They don’t get the sense that they are actually crossing a highway,” says Michel. Remote cameras are set up on both sides of the overpass, which is about as wide as a residential street. Large trees shelter the animals from the elements and buffalo berries regularly stop bears in front of the cameras, leading to fascinating images of grizzly bears as they feed. Elk, moose and wolves are also frequent users of the overpasses. There’s a total of six overpasses and 38 underpasses along the TransCanada from Banff’s east entrance to the border of Yoho National Park. The Wolverine underpass, located a couple hundred metres west of the overpass, is dark and dank — conditions favoured by black bears and cougars. In fact, 11 species of large mammals — grizzly and black bears, wolves, coyotes, cougars, moose, elk, deer, bighorn sheep, wolverine and lynx — have been recorded using both types of wildlife crossings more than 200,000 times since 1996. In addition, Parks Canada says the fencing along the highway has reduced wildlife-vehicle collisions by more than 80 per cent, with the number rising to 96 per cent for elk and deer. Black bears have been known to scramble over fences, while wolves and grizzly bears will walk across cattle guards without hesitation. It’s led to a couple of close calls with grizzly bears, a threatened species in Alberta. One grizzly has actually been struck by a car this year, but parks officials know it survived because it has since been tracked by its collar. Just last week, No. 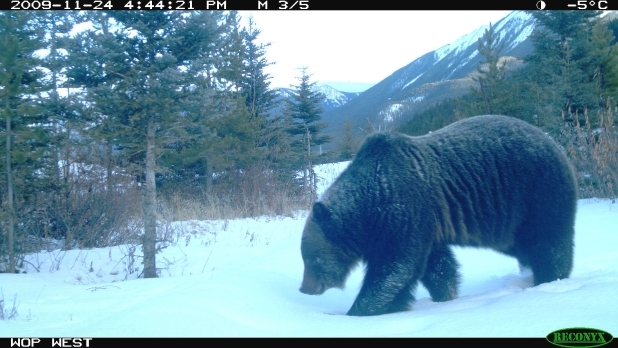 64, a 23-year old female grizzly dubbed the matriarch of the Bow Valley, and her three yearling cubs ended up on the highway near Sunshine Village and had to be herded back into the wilderness by parks staff. Michel knows of another hot spot near Castle Junction, where they captured a photo of a grizzly walking across a bridge into the middle of the divided highway. “We need to have something in place, like an electro-mat, to prevent animals from getting through,” he says, noting they are currently testing the electro-mats (similar to an electric fence, but embedded in the ground) near Lake Louise. Fencing has helped keep elk and deer off the highway, but Michel notes it was never designed with carnivores in mind. Similar questions are being asked about wildlife crossings. “There is no question we would have higher mortality if the fences and crossing structures weren’t here,” says Michel. “We know they are successful. “They are also really expensive,” he adds, noting the cost of an overpass is $5.5 million, up from $1.5 million in 1996 when the first ones were built.